By Matt Dyal | Matt’s Star Realms IGN is Ominous. He is an active member of the Star Realms Fan Created Community Page on Facebook and the Board Game Geek Star Realms League. When he is not busy playing Star Realms, Hero Realms and Epic, Matt enjoys prosecuting criminals in Northeast Oregon and spending time with his wife and two sons. 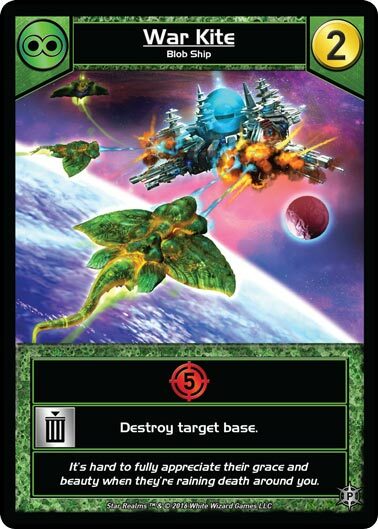 On September 13, White Wizard Games released the 7th expansion to the digital version of their award-winning deckbuilding game Star Realms. This expansion, which contains Cosmic Gambits and Year Two Promos, gives players nine new Gambit cards, 10 new ships—each faction gaining a ship costing two-trade and one costing five-trade—and one new base. Some of the highlights include the Blob War Kite, the Star Empire Knightstar, the Trade Federation Bounty Hunter and the Machine Cult Cargo Mech, along with the highly sought after Merc Battlecruiser and Mercenary Garrison that were previous only available in physical form with the purchase of a Legion Supplies storage box. 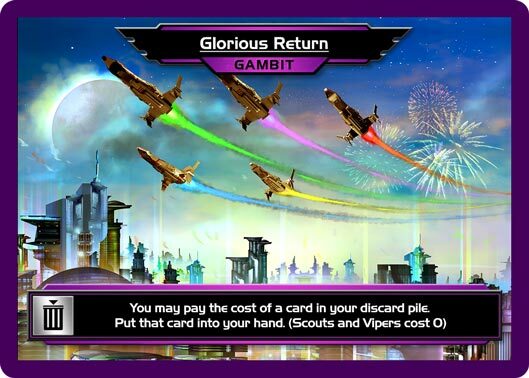 While many of the previous Gambit cards had a persistent effect, only one of the new Cosmic Gambits cards (Veteran Pilots) does. The rest must be revealed or scrapped for a one-shot effect. Three (Asteroid Mining, Hidden Base and Two-Pronged Attack) introduce a new dual scrapping mechanic, which have an effect when revealed, and another when scrapped (which can both be done on the same turn).. 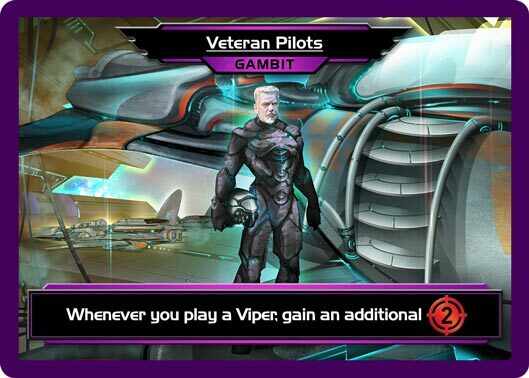 The Veteran Pilots gambit is simple; Vipers, the ubiquitous starting cards that deal one combat, now produce a punishing three combat each. Suddenly two Vipers in hand isn’t so bad! This should resolve the debate about whether to scrap Scouts or Vipers. 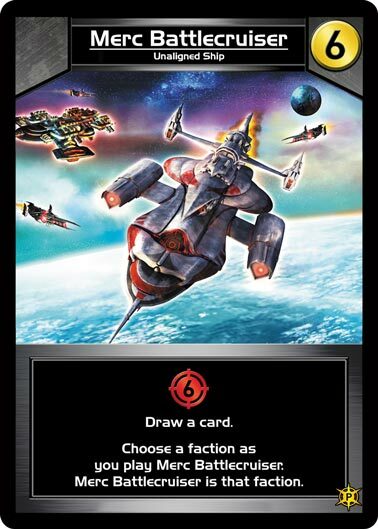 Colony Wars introduced cards such as the Battle Bot and the Oracle that only scrap from the player’s hand, thereby forcing players to choose between thinning out their decks or using those Scouts and Vipers for trade and combat. 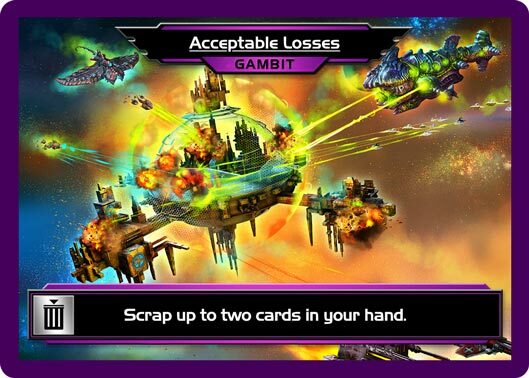 Acceptable Losses presents a similar dilemma in that it gives a player the ability to immediately start thinning out his or her deck by scrapping two cards but those cards must come from the player’s hand. It is best to use this card as early as possible to really maximize its impact. As a scrap proponent, this is my favorite of the Cosmic Gambits. In contrast with Acceptable Losses, Exploration allows a player to scrap a card from hand or discard pile, then to top-deck a free Explorer. Similar to Acceptable Losses, this is an excellent first turn play. 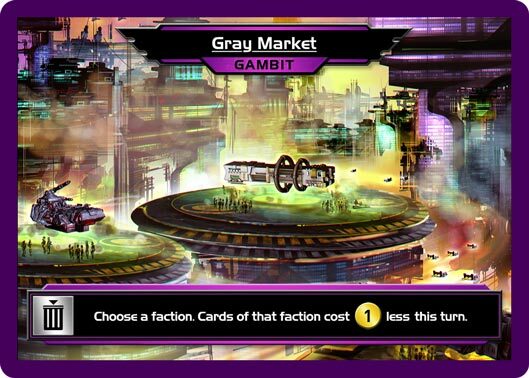 Like Glorious Return, Gray Market is also newly created for the digital game. With this card, a player can chose a single faction, and for the rest of the turn pay one less trade for each card belonging to that faction that the player purchases. And yes, that makes one-cost cards free. In contrast to Year One Promos like Megahauler and The Ark, the Year Two Promos feel more like the Battle Screecher in the way they integrate with previous releases and just feel like they’ve always been a part of the game. What is it good for? 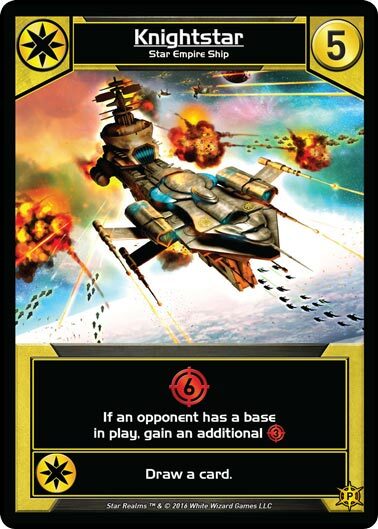 Well…with the ability to deal five damage and self-scrap to destroy a target base, the War Kite replaces the Battle Pod as the Blob’s most powerful stand-alone two-cost ship. Since most of the bases in the game have a Defense of 5 or less, this one little card can often take out two bases by itself. 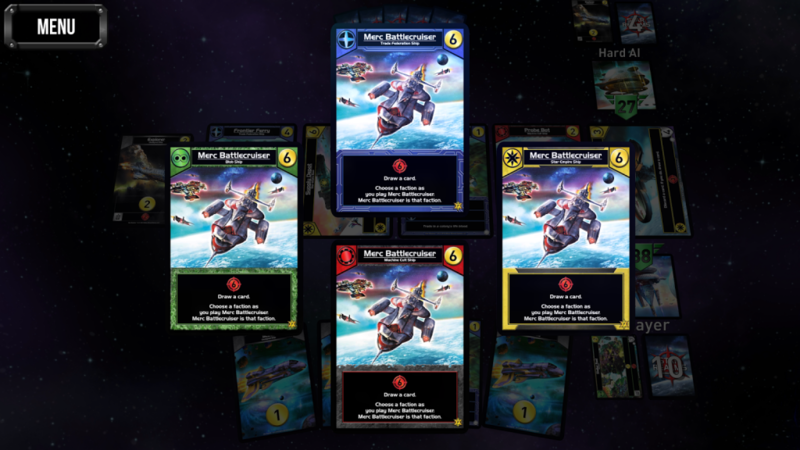 Anyone who has ever played a game against Star Realms creator Darwin Kastle knows how difficult it can be to overcome a wall of bases and outposts. The Star Empire’s latest ship seeks to aid players in that very task. Utilizing the “if an opponent controls a base” mechanic first introduced with the Lancer, the Knightstar generates six combat, and if an opponent has a base in play, gains an additional three combat. As if that wasn’t enough, the Knightstar also factions to draw a card, making it an automatic purchase for five trade. The Trade Federation has never been known for its combat ability, but that may be changing. Colony Wars introduced the Peacekeeper which dished out six combat and gained its controller six authority. Now comes the Bounty Hunter which deals seven combat and factions to gain five authority—all for the cost of five trade, making it a great opening buy for the aggressive player. 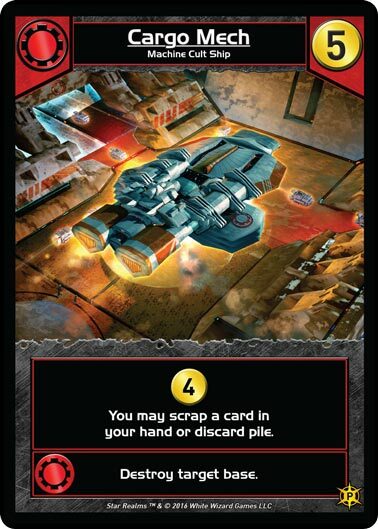 For those big-spending Machine Cult fans, the Cargo Mech joins the Freighter and the Gunship as one of the few cards that generates four trade (but unlike the Gunship it doesn’t have to scrap itself to do so). Like many mid-cost Machine Cult cards, the Cargo Mech also allows the player to scrap a card from his or her hand or discard pile. The most natural comparison is with the four-cost Mining Mech which provides three trade, scraps a card from the hand or discard pile and combos for three combat, whereas the Cargo Mech exchanges the three damage for the ability to destroy a base. This is another must-purchase. Like its predecessor the Merc Cruiser, the Merc Battlecruiser is an unaligned ship, which means the player gets to select which faction the ship will ally itself with each time the card is played. Thanks to a nifty bit of programing, the Merc Battlecruiser then changes its border to match the faction the player selected. 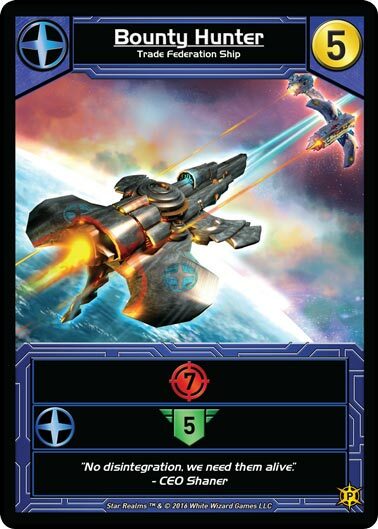 In addition to providing an automatic ally, the Merc Battlecruiser also delivers six combat and draws a card. 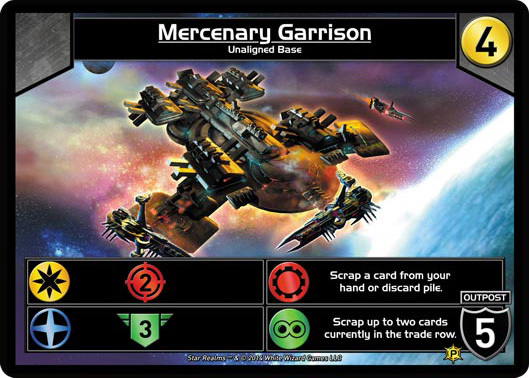 Similar to the Merc Battlecruiser, the Mercenary Garrison is also unaligned, but rather than the player selecting the faction, any (and all) factioned cards played trigger various abilities within the Garrison. For example, if the player played a Trade Federation card, he or she would trigger the +3 authority ability of the Garrison. Likewise, if the player played a Machine Cult card he or she could also scrap a card out of hand or discard pile. It is important to remember that because the Mercenary Garrison is unaligned, it will not trigger ally abilities of the other cards played. Remember: the Mercenary Garrison is unaligned and will not trigger ally abilities. In addition to the new cards, the White Wizard team also updated the app to include optional expansions when seeking new games, realtime challenges and a favorite players list. 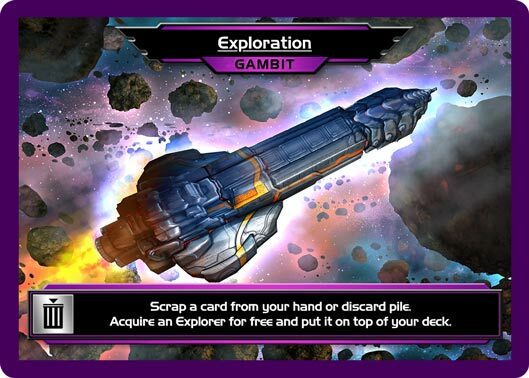 Update your app to get these new features, and buy the Cosmic Gambits expansion to get all of these new cards, as well as two new chapters for the Star Realms campaign story!